If you are looking for mother's day gifts for a geeky Mom, you can check out Geeky Gifts from geek alerts site. I found lots of good deals for interesting gifts that you can give to Moms. They have all sorts of coupons for your favorite store that sells things from simple gadgets to fancy ones that you only see first time. If the one you wish to give something likes star wars and collect star wars mementos, check out the LEGO Lord of The Rings geek stuffs that geek alert features. Everyday, this site posts different gizmos that you can find in the market. It is very interesting to know and you will be amazed of how the technology really flourished now a days. It seemed like everyday one gadget is out for the consumer to try and buy. Aside from this interesting electronics, gadgets, and other gizmos, they also offer different coupon codes that shoppers can used to buy these gadgets. If you check on their site, you can access coupons to different stores where you want to buy these gadgets from. As a matter of fact, if you need ink, you can snag out this Inkgrabber coupon code to use and get your computer some ink. We used to much ink to print out our school stuffs. I can use this code as well. Check it out now before it will be gone. I am planning of training for marathon. My problem is time. I am thinking of doing my running time after I dropped off our preschooler. If I do this, I need a jogging stroller for the little one. It's been a long time that I really wanted a jogging stroller and I always put it off. Last week I already disposed the twin stroller that we have. I gave it to a friend who just gave birth and has a toddler. I hope I can find a good deal on jogging stroller soon. I also want to have an ipod touch so while running I can listen to music. It will not be that boring running by myself. Hubby have an ipod but he always bring it to work. He listens to music there as well. My birthday is coming up and it may be the one I will be asking from him for a birthday present. I bet he will say, just use mine so we will not buy anymore :-) I don't mind as long as I can have something to bring when I go running. Last weekend before I went to work I tried to spruce up our front yard. We had some plants planted there by the builder when they built the house but we kind of become tired looking at just green plants so we replaced some of it. I did all the work that day and also put in some mulch on top of the old ones we had. 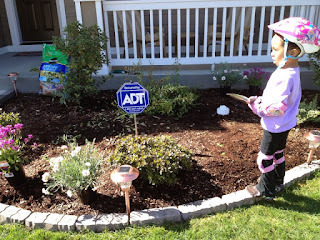 We also added the stone edger to define the flower bed. I still have some flowers to be planted but did not have the time. I may be able to finish it tomorrow after church. The picture above was taken before and this one below was taken after. Mother's day is coming up and I am missing my Mom the most. It is going to be about 3 years since we've last seen her. For the span of time that I haven't seen her, so many things have changed. She went through a lot. When we are going to see her it will be very different. Gone is the Mom that I last saw as very active, healthy, and do everything by herself. She had a stroke and now wheelchair-bound. I wish to send her seranataflowers because she is very special. I know she will be very delighted once she received flowers. She loves gardening when she had the ability to do so. We have little farm that her and my Dad tended, and they plant different flowers and fruit bearing trees. Speaking for plants, as new homeowner we are now starting to plant flowers in our yard. Yesterday before going to work, I did our front yard. I did a little landscaping although I still have flowers that needs to be potted. We have flower beds at the backyard that needs plants, and I can't decide what to get. I am always researching and reading information on how to take care of plants because I really don't have vast knowledge about it. I wish I am like my mother that whatever she planted, it will really grow very nicely. We always call her the green thumb. I am excited though for whatever will come out of our gardening and landscaping project. Do you like to play bingo? I remember back in the days that our place will have a fundraiser and bingo is always the first to come to mind of the organizers. When I got here in the US, I and some friends will get together and play bingo. We go to friend's house and play while our kids having their playdate as well. Then I learned about online bingo (sign up now) where you get to play at the comfort of your home. This is very convenient but can get very addicting too. When you have all the luck to your side, it is hard to get up and stop. But I am pretty sure it will be a very nice past time, you only have to play consciously. Our method of playing bingo was fun because we have friends around us, but I know a lot of people loves to play online bingo. When I tried it before along with some friends, it was really exciting and fun. But I got busy with our two little girls and online schooling, so I stopped playing. I kind of miss it, but I know if I wanted to play again it is always there, I will just click online and presto. Technology is so advanced now that playing different games, not only bingo is very easy to do. I got hooked on different online games as well. As I have said, there are other things I need to prioritize and make those games a past time. For now, I will just enjoy reminiscing those days that I and my friends play Bingo at home. I am still planning to buy bingo set though. I think me and the kids can play during weekends with popcorn on the side. We have family movie time, we can also create a family bingo time. We can have board game time and a bingo time even for once a month only. This seemed to be a very good idea, don't you think so? Okay, we are not going but I wish we are. Two of our friends just came back from Disneyland vacation this past spring break. One friend and her family flew there and the other friend drove along with their 3 kids. She said they were able to buy disneyland tickets for the whole family at a very reasonable price. They got the best deal because they bought it ahead of time. She said if you are going to plan for a Disneyland vacation, you make sure to really compare prices and also check out different websites that offers tickets. My friend that went there and drove said they were able to really enjoyed it because they drove and made stops along the way. We are here in the west coast so it is easy to drive. I cannot wait for us to visit the place one day. My friend that lives in California told me that since they are so near to the place, they always get the whole year pass so that they can go in there anytime. I wish we are near there too, our little girls would surely love it. My husband will have a block leave soon and we may have to utilize those days to drive to California and visit Disneyland. I am so excited of this idea. Ever since I was a kid I dream of visiting Disneyland. It will be short time only until this dream of mine can come true. I told myself what did I put myself in to? Okay, I haven't been working outside home for years now. I worked as a holiday associate for an electronic store back in 2010 til early January 2011. From then on I just worked at home, blogging on the side. I also enrolled in an online program taking Medical Transcription and I am now on my last month. This past days, a friend of mine who works as a home caregiver asked if I can work part time. They need somebody they can really trust. There is only one patient and I will be working part time, 3 days a week with two 5-hour shifts and one 8-hour shift. I tried to applied and luckily got hired. Actually I started the orientation this afternoon, and my first shift will be tomorrow. Now, I have to make a family care plan to take care of the kids while hubby is still at work. For the time being, looks like the plan will work out fine. The problem now is when hubby goes to trainings and such. But for now, I am just happy that I have a job and hopefully I can soon have a good care plan that can work with my schedule. I am thankful to God for this blessing and I am looking forward for the coming days of what this new endeavor will bring. Last month we finally purchased a bedroom set after a long time of deciding to replace the old one we have. Now I wanted to put the curtain on that I bought to match our bedding, but my husband did not install the curtain rod yet. In our bedroom we have a wall facing the window that I love to put a mirror with. 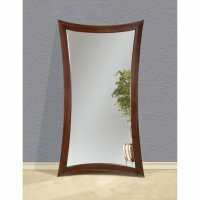 I have been looking for mirrors in home decor stores around but I can't find something that I like. I found some full length wall mirrors from SimplyMirrors.com and this mirror in picture caught my attention. It has a contemporary look in it with its bowed-in sides. Its rich, dark merlot-colored finish would compliment the color of our furniture as well as the color of the curtain that I bought. This is one of my bets for a mirror. I will still look for some more and see what I can find. If you plan about having a kiddie party and you want the kids to really have fun, a bouncy fun house can help on that aspect. During our DD2's birthday party yesterday hubby rented an inflatable bouncy fun house. We did not tell our girls that we rented one because we wanted to surprise them. The event staff delivered set it up at 1pm yesterday and as soon as the girls saw it, they were very excited. They get to test it first and the little one don't even want to come out of it. When the guests arrived and the kids saw it, everybody just run to the backyard and screaming. We may have to do the same on DD1's birthday because she really had fun more than the birthday girl herself. DD2 loves to go inside there but when the big kids are also inside she said she is scared. Poor baby. Yesterday a friend of mine who works in a private home care setting asked me if I wanted to work part time as a caregiver because her employer is looking for one. I was certified as nursing assistant back in Georgia, but it was back in 2007. She said that it is fine because there is only one patient to watch and I can just do a refresher here and then renew my CPR certification as well. It is very tempting because I kind of miss working already outside home and miss wearing a medical uniform as well. The schedule will be during weekends and it suits well because hubby can watch the kids. My problem is that, in June hubby will be going out of state for a training. This means I have to look for baby sitter for our 2 girls and if I will accept the offer now, I am still busy since I am in my last month of schooling to graduate with the Medical Transcription program. My husband already said it is up to me. I hope I will get some light and sign of what I need to do. Sometimes it can really torn you which way to go. I want to have a toned muscle and flat tummy. Yes, these are just among the wishes that I want physically and literally. It can't be denied that when you age, it is more difficult to lose the flabby tummy and cellulite are showing as you retain more fats in your body. I have those and I want it eliminated. My husband encourages me to run. He will run a marathon in first week of May. I wish I can join him even the half-marathon, but I did not start training yet. My goal is to train and hopefully will be able to run a marathon. I envied those Mommies that easily burnt out the pregnancy fats. I know some men and even women uses boosters to achieve the toned muscles and loose weight fast. I find out more about testosterone boosters when I researched about how to tone muscles. I think I don't need it. I am not into body building. I just want to tone my muscles to eliminate the cellulite. It is very discouraging when I wear shorts and it shows. Warm weather is approaching and I hope to wear shorts not being uncomfortable. So I hope my going back to running can help me attain this goal. 366 Blog Photo Challenge Entry #78. Spring is my favorite time of the year aside from summer. I love it when flowers starts to bloom. I also would love to plant flowers and vegetables in our backyard and front yard. This spring will be a test if I am a good gardener. We will start planting some flowers and I heard that Miracle-Gro® Expand ‘n Gro™ concentrated planting mix is among the best planting mix to u. The Expand ‘n Gro™ can make my plants beautiful and healthy, whether I plant them in ground or in pots. I know some Moms whose kids cannot go to sleep without having their favorite blanket. Even my brother when he was young his blanket was his comfort. 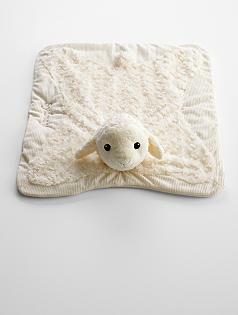 As a Mom do you encourage and have blankets for your kid wherever they go? Wit our girls, I let them have something to cuddle now that they are a little older. Good thing is that they are not attached to just one object. They have blankets and stuffed toys and they rotate the stuffed toy animals depending on what they feel like playing. I also observed that they like the toys in season. Like now that it is spring, our youngest love to play their bunny, ducks, lamb stuffed animal toys. She also love to use her yellow, pink, and lavender cotton blankets. Sometimes they will ask to bring it in the car, but they will leave it in the car once we get off. In a way it helps to entertain them and even use as their security blankets too. 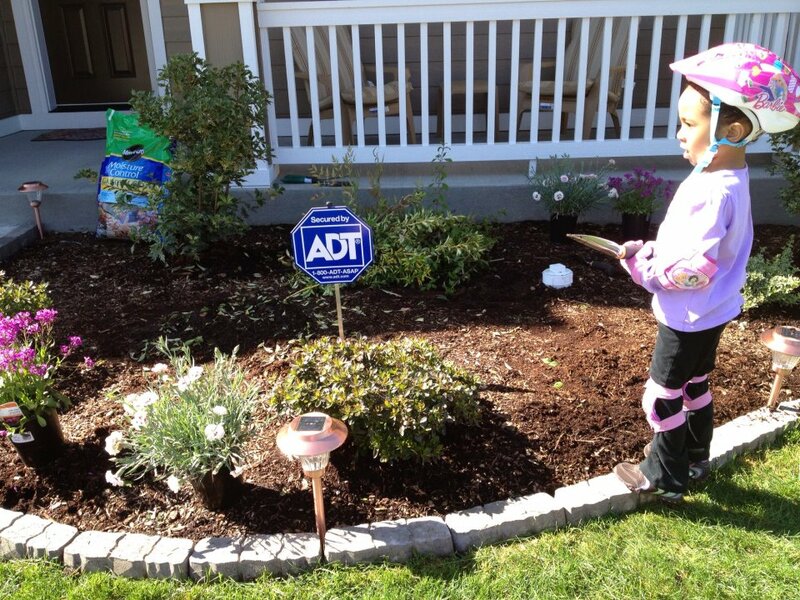 The kids getting ready for the egg hunt. 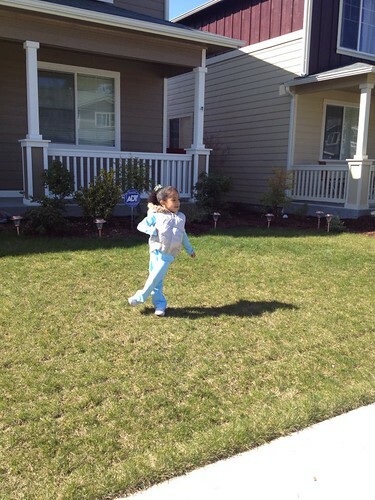 Yesterday we had a blast at a friend's place because we had the kids another round of egg hunting. I know Easter egg hunting was Sunday but because some of the kids were not able to have one, we decided to have one. We did it in our friend's backyard. The kids and the Mommies enjoyed it too. The weather was nice although a little bit cold, but it did not prevent the kids to have fun. I think the kids enjoyed it more than going to the park where there was mad dash of egg hunters. Our DD2 was very funny, every time she picked up an egg she will let me know the color before putting it in her basket. We may have to do it again next time, maybe in our backyard. I wish I had known beforehand about the Scotts® Snap® Spreader System to use in fertilizing our lawn, I could have use it this past weekend when hubby decided to fertilize the damage lawn we had from the past winter and constant raining. I am hoping our yard will be revived soon so we can enjoy playing looking at it. This is our front yard below, in picture. As you can see the grass are kind of brownish in color. I like it to be very green and healthy looking. I want this lawn to look like this picture below: I grabbed the picture at Scott's facebook page. Yes, isn't it a gorgeous lawn? When we moved in here, our lawn was like this green, but because fall and winter passed by, the color is not the same. I am hoping with the use of the Scotts ® Snap® Spreader System we can achieve this type of lawn. The testimonial of different users in the montage below really sold me in having one of these. Very easy to use and no spillage of fertilizer products. It snaps, lock and go. I cannot wait to try and have one. Like Snap perks on Facebook and be in the know of how to beautify your garden. 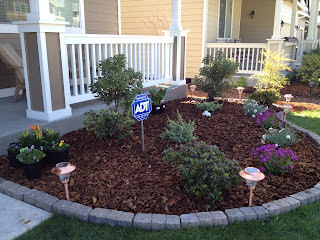 I love to do a simple landscaping project for our yard and hope I can snag some great products from them too. Lately we are blessed with nice weather. The temperature is around the low 60's and the good thing is it is not very windy. My girls had fun playing in our backyard while I and hubby were busy cleaning up the yard, pulling weeds and adding more mulch. We were thinking of making some flower or vegetable beds so I can start planting. We bought some gardening stuffs at a home store but we are still not done. This past weekend hubby was able to fertilized the front and back turf so the grass will grow more and become greener. I hope it will really grow pretty soon. I am also in the process of planning a little landscaping for our front yard. I can't decide what flowers to plant. If you go the home store you will be overwhelmed of the many choices. Hopefully we can somehow complete our garden plans before summer, where it is going to be so hot to work outside. When summer comes, I just want to sit back and relax and see the flowers in full bloom. This is a Sponsored post written by me on behalf of Triad Retail Media. All opinions are 100% mine. Coming from Asian country, I love cooking Asian cuisines that has strong flavor and sometimes the smell can really turn off visitors. Joking aside, my problem then was the pungent smell after I cook or fry dried fish. Good thing now that there is the new Glade® Expressions™ fragrance mist that I use and placed in the kitchen while I cook. I chose the cotton and Italian mandarin scent so that instead of smelling the dried fish, I can smell the orangey-scent from it. It has a long-standing fragrance that I like the most. I did not cook dried fish inside the house for quite sometime. I have to go outside and use the side burner of our grill. But thank goodness, Glade® Expressions™ products came. Aside from the fragrance mist, there is also the new Glade® Expressions™ oil diffuser. The oil diffuser fragrance lasts 30 days and doesn't require electricity. How about that? You will have a smelling good room without energy wasted. These are all designed to compliment any home decor, as you can see the picture above. You can display it anywhere you want as it looks really pretty. If you already have the kit, the fragrance mist is refillable with any Glade® Expressions™ scent. Pick out what you like or even try them all and see what you like the most. As a matter of fact, there is a coupon for $1.50 off of any Glade® Expressions™ that can be used at Walmart to take advantage of their everyday low price. You can use the coupon too and try out this new Glade® Expressions™. To assure the users that this product really delivers as it promised, you can mail-in this certificate here if you are not satisfied. You can have your money back when you are not happy with the product. Just fill the form and send it. As for me, I did not use it because I am a very happy Mama and made Glade® Expressions™ our new home freshener. 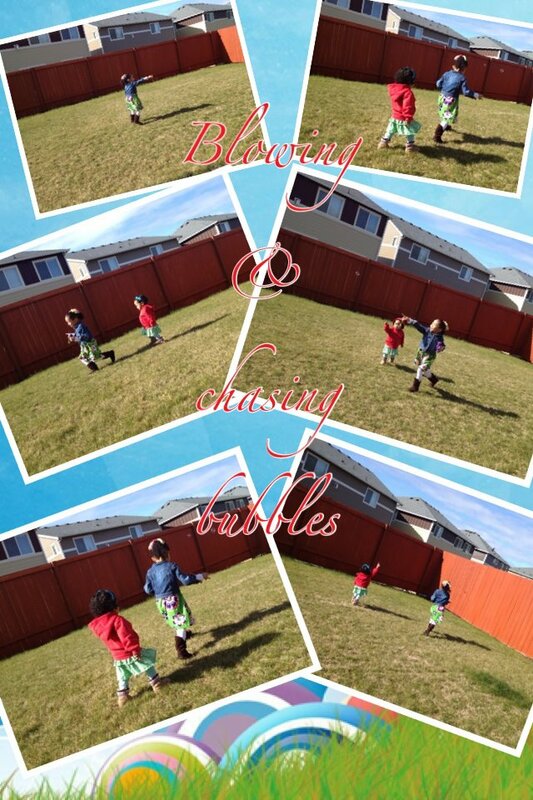 PicCollage is an app for iPhone that will let you play your pictures and and make a collage out of it. I am enjoying the app, it is kinda like scrapbooking on your iPad or iPhone. My first picCollage was our DD1's few pics while playing bowling. My friends have the other pictures and these two were the only photos I took during that day. 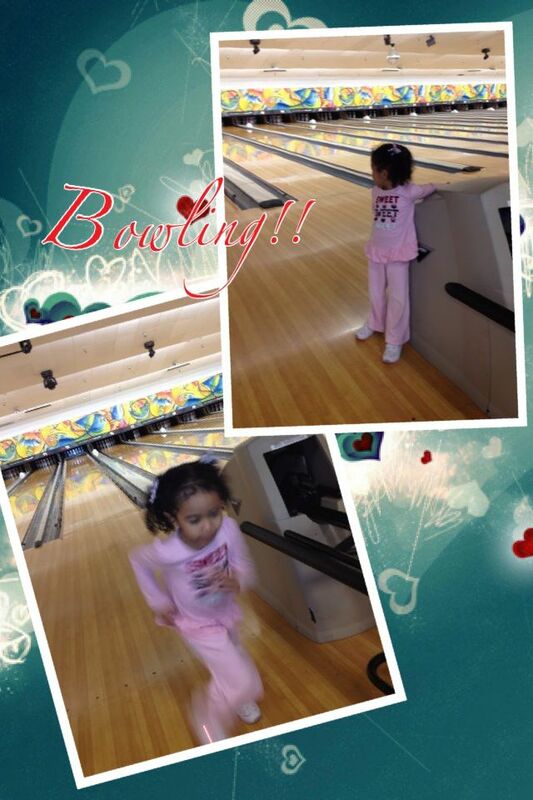 I think bowling is one of the sports that our DD1 first to like. She said she wanted to go back and play as well as learn to skates too. I am glad she is showing interest in sports. She is a shy-type girl and encouraging her to be outgoing and play different sports can build her confidence and overcome shyness. Linking this picCollage for 366 Blog Photo Challenge as my entry #72. Are You Up for the Spartan Race Challenge? This is a Sponsored post written by me on behalf of Spartan Race. All opinions are 100% mine. Do you know about Spartan Race, the new craze right now in pushing your body to the limit and a revolutionary way of working out? Well, if not then check out Spartan Race now. The idea why this is created is to have fun and be entertained while working out. This is also another way of the family to bond and achieve the goals of having a healthy body and sound mind in a Spartan way. My husband love to run marathon and he is encouraging me to join him. I am still in the process of conditioning my mind since it will really entail and needs time and effort. I don't want to embark on something half-bake, willingness wise. This Spartan race sounds interesting. It will not only make you physically fit but can mentally challenge you, which is a good way to build more confidence and toughness. The Spartan Race starts with a beginner challenge of 5K sprint trail and mud races. I needed this. I have been telling myself to get off our couch and start hitting the trails near us. After this trail race there is the marathon runs, but wait, accordingly not only purely running but with obstacles of course. The Spartan Race organizers though assured that 99.9% of those who tried this saw the finish line and fully satisfied. I think I have to introduce this to my husband who loves races like this. He will not only like it but I am pretty sure he will love and enjoy the race and challenge. I want to try it too. So, are you up to the challenge? If so, check out and sign up. For more information and if you want answers to your questions about Spartan Race, check out http://www.spartanrace.com//spartan-race-obstacle-course-faq.html as well. Get the physical boost that you need and be mentally tough! If you can endure the challenges here, you will surely surpass all the obstacles that life throws at you.